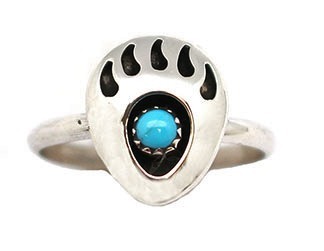 Sterling Silver Shadow Box Bear Paw Ring has a 3mm Sleeping Beauty Turquoise stone. It measures approximately 1/2″long by just over 3/8″ wide. Beautifully Navajo crafted by Ida McCrae.